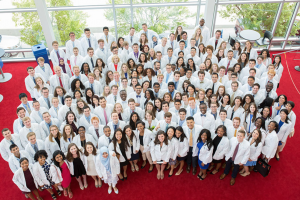 On September 16, the UNC School of Medicine Class of 2021 was formally welcomed with the annual White Coat Ceremony. 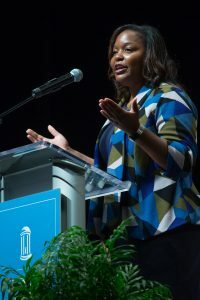 The event, held this year at the Durham Performing Arts Center, is an opportunity for students, along with their families and friends, to celebrate their accomplishments and look forward to the beginning of their medical training and career. The event began with a processional, followed by remarks from UNC School of Medicine leaders including Dean of the UNC School of Medicine, William L. Roper, MD, MPH, and Executive Dean, Wesley Burks, MD. The keynote address this year was given by Keisha Gibson, MD, MPH, chief of pediatric nephrology. Following remarks from Gibson, each member of the class of 2021 came to the stage and was presented their white coat by Georgette Dent, MD, Associate Dean for Student Affairs. The white coat is one of our most symbolic garments, and receiving the white coat marks the formal beginning of the medical careers of these 180 students. As is tradition at UNC, each student’s coat contained an inspirational message from a UNC SOM alumnus in the front pocket. The “Words of Wisdom” effort is organized by the Medical Foundation.